TANJUNG LESUNG, Indonesia (AP) — Indonesian President Joko Widodo on Monday toured areas devastated by his country’s latest tsunami, as efforts to collect the hundreds of dead and save the injured were stepped up and scientists collected evidence on how a volcanic eruption triggered the tragedy. Casualty figures from Saturday night’s disaster continued to rise, with at least 281 people confirmed killed and more than 1,000 injured. 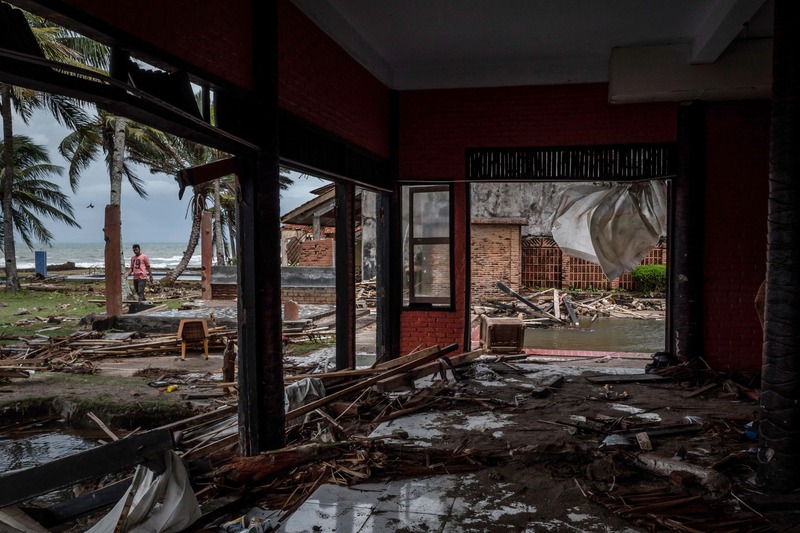 They were certain to rise further, with scores still missing from the affected areas along the coastlines of western Java and southern Sumatra islands, where hundreds of military personnel and volunteers were conducting their grim search along debris-strewn beaches. The waves that swept terrified locals and tourists into the sea along the Sunda Strait followed an eruption and apparent landslide on Anak Krakatau, or “Child of Krakatoa,” one of the world’s most infamous volcanic islands. Dramatic video posted on social media showed the Indonesian pop band Seventeen performing in a tent on Tanjung Lesung beach at a concert for employees of the state electricity company. A wave smashed through the makeshift stage, tossing the band and its equipment into the audience. The group released a statement saying their bass player, guitarist and road manager were killed, while two other band members and the wife of one of the performers were missing. On Monday, five more bodies were recovered around the hotel, including a little boy. President Widodo, who faces what promises to be a tough re-election campaign next year, responded Monday to the lack of any warning of the disaster with a vow to have all equipment used for detection of tsunamis replaced or repaired. Sutopo Purwo Nugroho, spokesman for Indonesia Disaster Mitigation Agency, acknowledged on Twitter that the country’s network of detection buoys had been dysfunctional since 2012, due to vandalism and budget shortfalls. But the head of Indonesia’s Meteorology, Climatology and Geophysics Agency, Dwikorita Karnawati, said Monday that the tsunami was caused by Krakatau’s volcanic activity, so could not have been picked up by her agency’s sensors, which monitor the conventional tectonic earthquakes that are responsible for more than 90 percent of the tsunamis occurring in the country. With Krakatau still erupting, she warned people to avoid activities around coastal areas in coming days due to high waves its activities and other factors. The president — popularly known by the nickname Jokowi — told journalists after arriving by helicopter in the disaster region that he has ordered the Social Ministry to give compensation to the families of the dead as quickly as possible. He praised the army and police, along with local government officials, for their work in evacuating shorefront areas, which are still considered a danger zone. Scientists, including those from Indonesia’s Meteorology and Geophysics agency, said the tsunami could have been caused by landslides — either above ground or under water — on the steep slope of the erupting volcano. The scientists also cited tidal waves caused by the full moon. Gegar Prasetya, co-founder of the Tsunami Research Center Indonesia, said Saturday’s tsunami was likely caused by a flank collapse — when a big section of a volcano’s slope gives way. It’s possible for an eruption to trigger a landslide above ground or beneath the ocean, both capable of producing waves, he said.